order to be more responsive to the constantly changing needs of their customers, companies are concentrating their resources on their core competencies. With this a rower focus, firms are now buying a sulDgtantially'g'reader proportion of the goods and services that go into their product than was previously the norm. In many cases, for example, the cost of the purchased raw materials and components 60 percent (and often higher) of the cost of goods sold. As a result there is now greater dependency on suppliers and the need to develop long-term supplier relationships. In addition, the logistical costs (that is, the transportation and distribution costs) associated with the delivery of products has continued to increase, as firms are now able to extend their supply chains to the far corners of the world. To further complicate matters, there is increasing pressure on managers to reduce their inventories, thereby placing further dependence on their suppliers. To address the need to reduce inventories, managers have introduced such concepts as consignment inventories and supplier-(or vendor-) managed inventories (SMI or Van, which we will discuss in this chapter. Advances in information technology have provided managers with a wide assortment of t oils that allow them to better oversee their firms' supply chains. These include electronic data interchange (EDI) and business- business (828) marketplaces. This increased emma- . sis on a firm's supply chain has caused. a dramatic shift in the role of the purchasing function. In the past, the purchasing function was typically viewed as being primarily a transactions-oriented function. 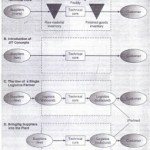 N wit is seen by many firms as playing a more strategic role in determining the overall long-term success of the firm.